Instructions: Using Sweet Plum ink stamp the pansies in varying sizes. Color the centers in Buttercup ink and then the remainder in the Lavender ink. Die cut with coordinating dies. Lightly mist and shape in the 3D Pansy mold. Highlight the edges with the Plumeria Ink. Using Bamboo leaves ink, stamp the leaves in varying sizes and color with the same ink and cut with coordinating dies. Lightly mist and shape in the 3D Pansy mold. Highlight the edges with the same ink. Using Smokey Gray ink, stamp the Delicate Pansy sprays, 3 in total, 2 of left spray and 1 of right spray. Color the leaves with the Bamboo ink and the flowers with the Lavender ink. Cut with coordinating dies. Highlight the spray with the Nuvo Glitter Accents. Using white cardstock cut 2 large tags from your Album Tags and Accents Die. 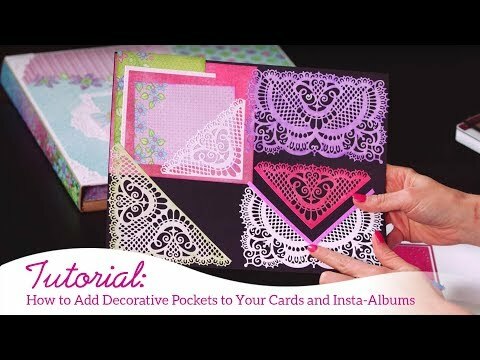 Using white cardstock cut 2 intricate die cuts with the Elegant Pockets Accents Die. Using Lavender ink, ink chipboard heading, cover in clear embossing powder and heat emboss. From the Burst of Spring Paper Collection, choose the selected cardstock, you will be using both sheets. will Tear the center section from your first sheet. TIP: Using a water brush, run a line just above the patterned area, this will wet your paper and make it easier to tear. Tear along the same section of the curve, repeat with the bottom curved section. Cut out the enjoying this moment tag. Layout Assembly - Using 3d adhesive adhere the center section. Using glue adhere the intricate die cut to the left side of the tag with the decorative top facing upwards. Using 3d adhesive, adhere tag facing up to the left side of your layout. Using glue, adhere the intricate die cut to the left side of the tag facing upwards. Adhere the tag facing down on the right side of the layout (so when adhered in place, the intricate dies will face one to the left and one to the right). Adhere the pictures on the tags. Adhere the first pansy spray to the top of the left tag, with the flourish facing upwards, add one large and one small leaf spray and then 1 large and 1 small pansy as pictured. Repeat with the bottom of the right tag. Adhere the third spray in the bottom left corner, so the flourish in facing out of the corner, adhere 1 large and one small leaf spray and then 1 medium and 1 small pansy. Add prills to all pansy centers. Adhere the heading using dries clear adhesive. Add "enjoying this moment" tag in the bottom right corner under pansy spray.